Picture credits “Kurt Soderling, Lesley Vogel, Gene Young, Colin Drummond” Save the Whales Again! 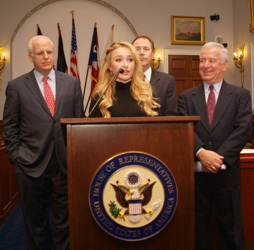 Campaign spokesperson Hayden Panettiere appeared at a press conference in Washington D.C. with Congressmen Nick Rahall (D), Chris Shays (R), and Senator John Kerry (D). The hi-powered group called on the Bush Administration to stand up for whales at the International Whaling Commission and take diplomatic and economic action against the whaling countries of Japan, Norway, and Iceland. Campaign Spokesperson Hayden Panettiere wins “Top Honor” at the 2008 Genesis Awards for her passion and commitment to saving dolphins and whales. Heroes star and Save the Whales Again! Campaign and Whaleman Foundation spokesperson Hayden Panettiere cried tears of joy and sadness Saturday night as the Humane Society presented her their highest activism award for protesting the dolphin slaughter in Taiji Japan last October.